HD steel rack comes with 4" HD swivel-lock wheels. Rack holds 60 football helmets. 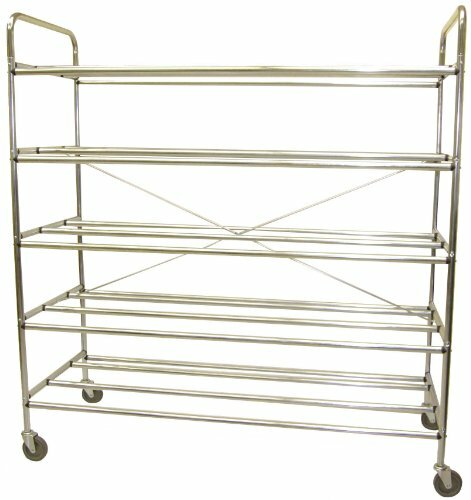 Size of 59"hx59"lx24"d allows rack to fit through a standard doorway. The country of origin is China. Four heavy-duty swivel casters. 32 hooks for neatly hanging players' helmets. Holds up to 30 shoulder pads for organized storage. Rigid base design increases strength and stability. Football activity. Warranty: One year. Black color. 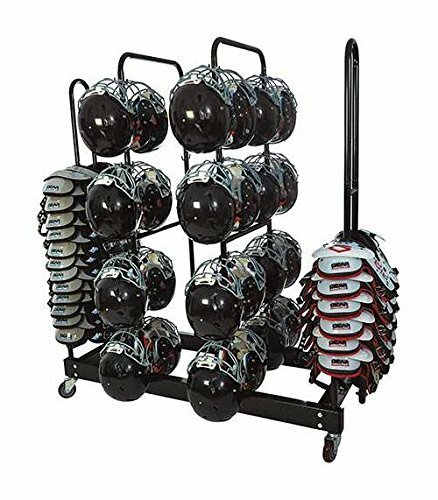 Keep your team's gear organized between practices, games and seasons with this Combo Football Helmet/Shoulder Pad Rack. As players place their shoulder pads and helmets on the rack, you can rest assured that the stable, rigid base will prevent equipment from tipping over. Powder coated finish tubular steel rack with 4 heavy-duty rubber wheels. Helmets are hung through the ear opening on rigid steel rods with safety curves. At last, a helmet rack that fits through standard doorways. The Champion Sports football helmet cart is made of 1 inch chrome-plated steel tubing with four heavy-duty swivel casters-2 of them locking. 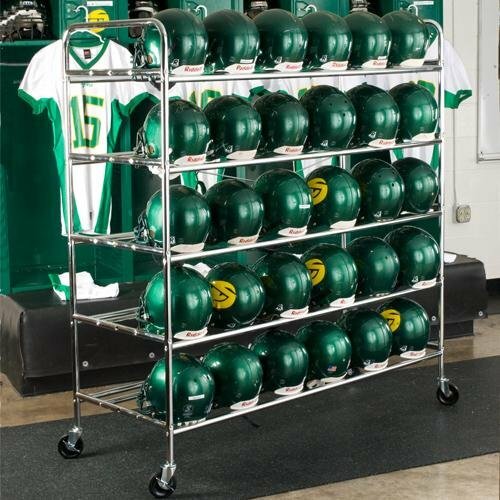 This cart can hold up to sixty football helmets, and can even be used for other sports helmets. 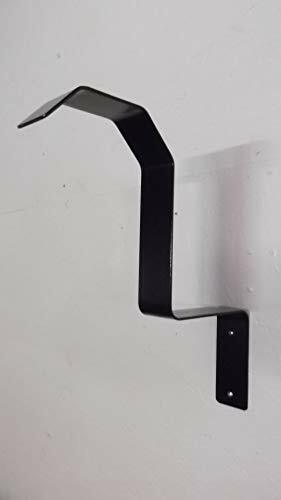 Hang virtually any helmet, any size, on the wall with this product Made from 1/8" x 2" steel and powder coated for an extremely durable finish. Hardware supplied. Money back guarantee. American made Hands down the best helmet hanger on the market, period. Helmets shown are for demonstration purposes and are not included or for sale. 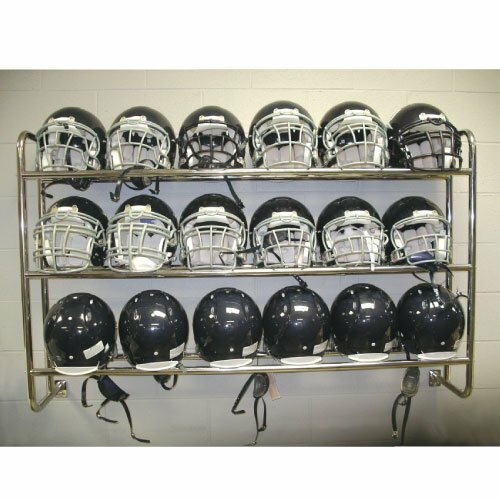 This wall mounted helmet/ball rack is constructed of chrome plated 1"steel tubing. It is easy to install with 4 screws which are not included. 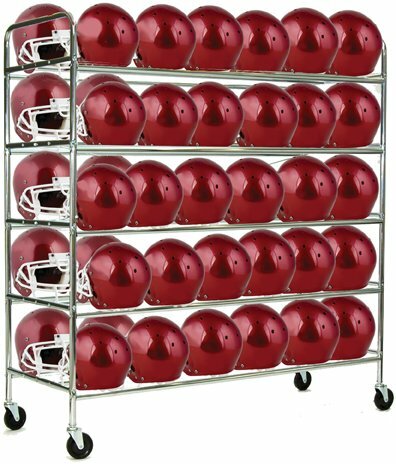 This rack will hold up to 18 balls or helmets on 3 levels. Size: 60"W x 40"H x 15"D - 18 lbs. The display case holds 16 1:2 Scale Replica Mini Helmets. Carefully crafted from solid wood, this display case would be perfect to showcase your collection of mini helmets. When hang on the wall it is just like a piece of art itself. It has a hinged Acrylic door to prevent inquisitive fingers. The hinges are on the top of the display case and the door latches are on the bottom. The wood shelves are removable. Wall brackets on the back of the display case for wall mounting. No assembly required. Dimensions: 27.5" W X 22.5" H X 6 1/8"D (exterior) Weight (net): 28 lbs Interior Dimension: 26 3/8"W X 21 1/2"H X 5 1/4"D Space between shelves: 5.25"
This solid furniture grade beech hardwood case features a UV protected acrylic door for keeping out dust and 4 shelves for displaying 32 Pocket Pros mini helmets. 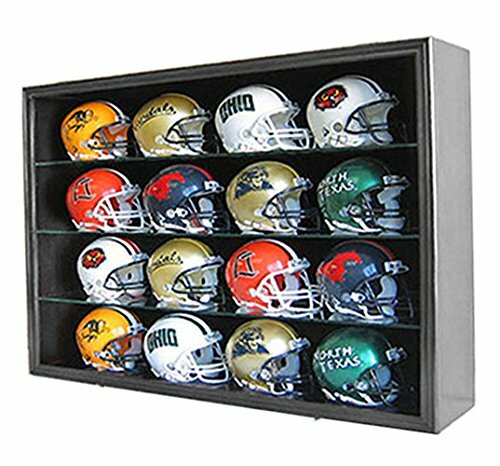 This case is prefect for displaying a full set of team helmets, all 32 teams and the case is even partitioned so that you can face against the 16 teams from each league. Wall brackets already on the back for hanging. You may also stand this on counter top. Back of the cabinet is lined with a lovely felt to give contrast to your displayed helmets. (pocket pro helmets shown are not included.) 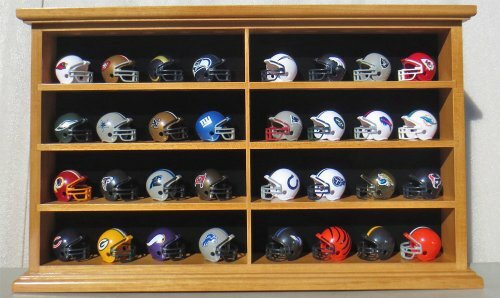 This cabinet is for displaying pocket pros scale football and baseball mini helmets. Looking for more Football Helmet Rack similar ideas? Try to explore these searches: Stacking Drawer, Directional Diversity Antenna, and Inflatable River Rafts. Look at latest related video about Football Helmet Rack. Shopwizion.com is the smartest way for online shopping: compare prices of leading online shops for best deals around the web. Don't miss TOP Football Helmet Rack deals, updated daily.